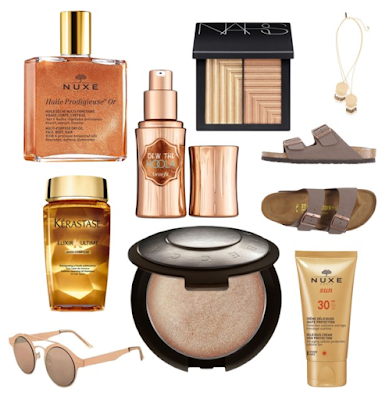 There's no better way to get in the mood for a holiday than to splurge on products that will accentuate your summer glow, or atleast day-dream about those that you would buy if it wasn't the end of the month and you're eagerly anticipating payday.. This post feels slightly dangerous in that the products mentioned may go from wish-list to accidentally-just-ordered list on one of those days where you just need an impulse buy or five to make you feel better. Deviating from any products that you actually need to take away with you, these are all purely luxurious add-ons that would make your holiday complexion that tiny bit better..
After trying a sample-size Nuxe Huile Prodigieuse from Sephora, I quickly realised why this is Nuxe's cult product and wanted more. This multi-functional formula that can be used on face, body and hair combines plant oils and vitamin E with a subtle, earthy fragrance. This edition is essentially it's summer counterpart; who doesn't want to be covered in shimmer all season and get a subtle, golden glow. I think it would come into it's own after a day sunbathing, giving your natural tan a boost and restoring moisture from sun-drained skin. One of Benefit's newest launches, a revamp of a bronzing cult classic, comes in a liquid form, leaving skin with a soft-matte, glowing finish to fake that post-holiday colour and cased beautifully in bamboo-esque packaging. If I hadn't already spent most of the month buying things I definitely don't need, this would be at the top of my list. As I have fair skin, any product that enhances sun-kissed skin without having to endure the heat for hours (and consequently, burning) is music to my ears. BECCA has taken highlighting to the next level and (literally) outshines any other brand equivalent that I've tried. I've been testing out a travel-size version of the highlighter this month after picking it up in New York, and I am completely sold by the brand. The product pigment is second to none, and creates a luminous, defining glow on your cheekbones that works amazingly with any bronzer. If it wasn't for the slightly hefty price tag, this would already be in my make-up bag. As sad as it is, buying a new sun cream before a holiday gets me just as excited as buying that long lusted after holiday sundress or flip flops. Just to use on your face, the cream promises to activate the appearance of a natural tan, slows down the signs of premature ageing and protects against UV rays. A sun lotion that doubles up as a face cream can only be good news. As a self-confessed addict to Nars in general, I can't get enough of their products. I swear by their Laguna bronzer and have repurchased multiple times. I don't typically wear blusher, and if I do I tend to stay away from pinky tones and veer towards earthier, browny tones. This combination is a match made in heaven and ideal for vamping up your tan post-holiday and it is taking all my willpower not to add it to my ASOS basket. A brand that I am yet to try and literally see in every hairdressers (a promising sign of approval), the premium brand Keratase promote science as the key to their much lusted-after formulas. Protecting, strengthening and hydrating, I am always keen to try a new hair oil, especially in the summer months when your locks need as much moisture as they can get.